Both Montessori Weaning and Baby-Led Weaning (BLW) emphasize that the child should lead the eating process (by communicating when they are hungry or full). This is important for the child to understand their own body and know how to communicate their needs. This also means at the tail end of the weaning period (the cessation of milk/formula), the baby leads the way. If they are choosing food over milk, that's the signal to move on from milk/formula. Both Montessori Weaning and Baby-Led Weaning (BLW) emphasize the child's part in feeding themselves. BLW tends to be more of the opinion to allow the child to self-feed with their hands at first and introduce a utensil later, while Montessori focuses on self-feeding within a cultural context where the child is introduced to all the cultural tools relevant to eating. This helps the child who is becoming independent with self-feeding can do so as a full partciipant in the community experience of the meal. Because of this emphasis on functional, child-size versions of adult eating tools, children with Montessori Weaning will have access to utensils, small cups, plates and a placemat. Find examples of Montessori eating tools here! Baby-Led Weaning (BLW) is an approach that focuses more on food in its natural state (as opposed to “baby food” or purees) that can be large enough for the child to hold, experience and taste. In some circles, there is also a move toward "chunky" food with the idea that the baby will learn not to choke by learning to chew - this part of BLW is not always practiced. The Montessori approach also focuses in food in its natural state (as opposed to “baby food”), but isn’t as opposed to soft, mashed or pureed food. Because of the emphasis in Montessori Weaning on the child’s use of utensils, the food’s consistency is a key component. In Montessori, children often start with natural fruit juices so that the spoon can be introduced without the obstacle of having to chew. Then, the child moves to soft or pureed foods that will stick to the spoon, but by 8-9 months, the child moves to small versions of adult food. 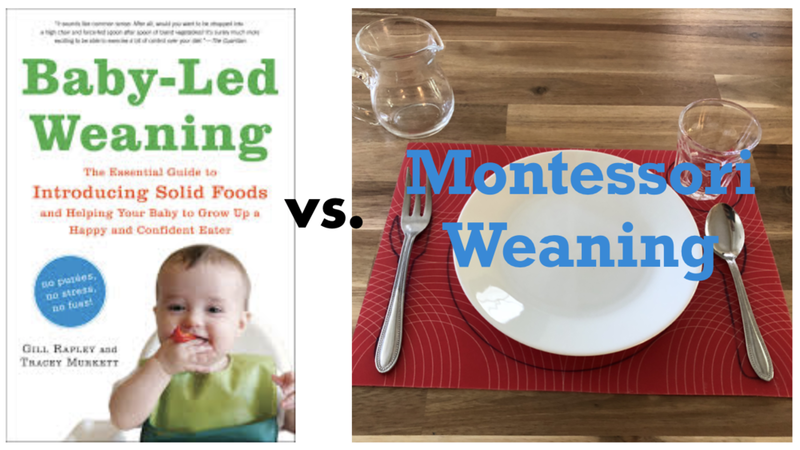 One of the biggest differences with Montessori Weaning and Baby-Led Weaning is the emphasis on not just what is eaten, but how and where the baby eats. Eating is a highly social and cultural act and in Montessori Weaning, there is a strong emphasis for the baby to be included at the family table through the use of a tray-less high chair and by including the baby in adult mealtimes (instead of waiting until the baby goes to sleep). The typical introduction to eating in Montessori Weaning includes a low table and chair for the child (“Weaning Table and Chair”) to be able to join a table on their own that fits their body, but the child is quickly then moved to a high chair at the adult's table to join the adul't’s meal. Because the "weaning table and chair" is often short lived, many families opt for just the tray-less high chair from the start, but low eating tables and chair are the norm in Montessori infant classrooms. Want to see Montessori Weaning in Action? For video guidance on Montessori weaning and the introduction of solids, check out our online tutorial! If you want personalized support and advice about starting solids or having your child at the family table, check out our Baby & Me classes and Home Visits!